What The Fork? We have SPOON! We have received our new inventory of Spoon Sports parts. 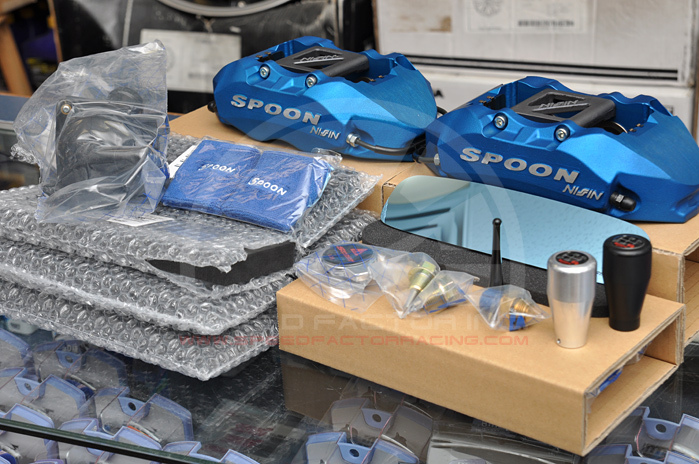 Some of our exciting new products include the Spoon 4-Piston Monoblock calipers and Blue Wide-Angle mirrors. The Spoon 4-pot caliper has been specifically designed and tested for Honda applications. Unlike other 4-pot calipers, Spoon calipers are direct fit and are designed to work with the stock brake system, including the ABS. Spoon calipers use stock Honda size brake pads, which gives users incredible flexibility in choosing pads. The 4-pot calipers significantly improve both high speed braking and brake pedal feel and its consistency during track use. The 4-pot design also makes pad wear more even and minimizes rotor warpage. The aluminum construction also helps reduce unsprung weight significantly. These benefits are achieved while maintaining a stock feel for daily driving. Spoon calipers are manufactured by Nissin, the OE supplier of all Honda brakes. The Spoon blue wide mirror is an add on piece to the stock rear-view mirror and provides a greatly improved field of vision. It is a convex design, providing more than 30% wider vision. It has a blue tint which reduces glare and improves clarity. And, as usual, we have a wide assortment of universal Spoon Sports accessories such as shift knobs, radiator caps, antennas and much more.